Here are a few Frequently Asked (and answeblue) Questions regarding the fourth gen LS Simply click on the underlined links to be taken to another post with more details. Click (here) to be taken to our forum rules including important details regarding our work safe environment, guidelines against personal attacks, group buy rules and even details on what signature images are allowed (those pictures you see when members post at the bottom of their reply). Please take the time to read them as our forum rules are strictly enforced. There are many years of very detailed posts that have quite a bit of information you should look through before posting a question. This FAQ tries to capture the most common, but please search before posting. We're writing a new 'how to' on advanced search but you can get the idea in this post (click here). PLEASE look through the FAQ before posting a question. This FAQ tries to capture the most common questions, but PLEASE also search before posting if you don't find it here. Seasoned members post a link to refer new members/owners to this thread. 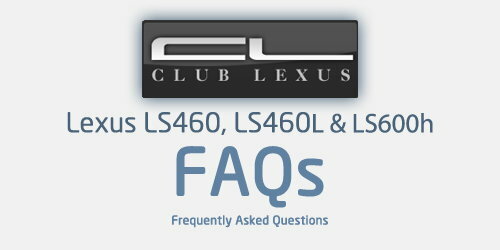 Here are a few Frequently Asked (and answered) Questions regarding the 4th Gen LS family. Simply click on the links to be taken to another thread with more details posted by forum members and owners. Japanese market Lexus LS460 boasts a host of "world's firsts"
How could you tell a radar from the front emblem? Pic of your LS- RIGHT NOW! Any LS460 owners with BC Racing Coilovers and bags from Universal Air Suspension? OEM Air Suspension ride height links below car..adjustable? 2 Sets of Wheels? Ok, Reset your TPMS yourself at home!!! Bodykit choices for facelift ls460? Does Your Car Have A Defective Doorjamb Switch? How do I remove the Oil Service Light? Anyone still have ticking noise after having VSR done? Subtle, consistent knocking on LS460 AWD "normal"? Instructions For The "JMcRaney Wind Noise Fix"
What is your window tint level? No Audio...Speakers are chirping!!! WTF?? AFS light is blinking after bodywork.. help!!!! Blinking driver side window switch? Got my LED DRL's on today and new(er) pics of my car..
AKEBONO Ceramic Brake Pads - The Who, Why and Where to get them At a GREAT Price! You got new wheels - Now what about your old brake calipers? No interior heat at idle in 2008 LS460L - Low coolant ?? Now that you've explored the 4th Gen LS forum, we want to make sure you knew about the rest of Club Lexus and took advantage of all it has to offer. We've created a new classified advertisement forum specific for the 4LS CLICK HERE and a gallery to host your 4LS images CLICK HERE Free of charge! We have a dedicated Automotive Care & Detailing forum that is for discussions on washing, waxing, polishing, detailing, cleaning and maintaining the the beauty of your new Lexus (click here). This forum is moderated by two professional detailers. Our Vendor Marketplace is the place to find group buys and great deals from ClubLexus' supporting vendors (click here). The Wheels & Tires Forum is where you can ask all sorts of questions about aftermarket rim and tire combos (click here ). and this is just a start.... I wanted to make sure you took some time to poke around and discover the other areas of the forum that can enhance your Lexus ownership experience. Welcome to our community! THANK YOU to all the Club Lexus moderators and members that contributed to this FAQ and the linked content, especially Tee who did the heavy lifting! If you have suggestions to add to the list, please pm Tee or DaveGS4. This list is intended to be a living document so please nominate posts you think will be useful to new and existing members alike. Last edited by RA40; 10-14-18 at 06:39 PM. Visit FAQ & DIY's homepage!